The University of Illinois Extension Office will be offering Master Gardener Training Classes for Henderson, Knox, McDonough and Warren counties starting March, 15 2019. Master Gardeners are volunteers who have a love of gardening and a passion to share it with others. You need not be a garden guru to be a Master Gardener. The program focuses on learning for the love of learning. The opportunity to meet fellow gardeners and share knowledge with the community is exactly what makes the Master Gardener program so popular. During Master Gardener training, attendees have the opportunity to learn about gardening from University of Illinois educators in a way that is both interesting and practical to the home gardener. The classes are geared for all levels — from beginners to more experienced gardeners. Trainees attend class one day a week for 10 weeks. Each week features a different hands-on horticultural and gardening topic including botany, vegetables, lawn care, tree and small fruits, diseases, insects, soils, composting, pesticide safety, fertilizers, pruning, trees, and flowers. The most rewarding parts about being a Master Gardener comes from the friendships made with fellow gardeners and making a difference in your community. Master Gardeners volunteer at a variety of different community garden projects. They grow vegetables for the local food pantry and spend time in the educational and community gardens in Galesburg and Macomb. They have a Gardener’s Day Workshop each April, and annual plant sale in May, and help organize the Monarch Migration Festival in Galesburg in September. There is something for everyone. 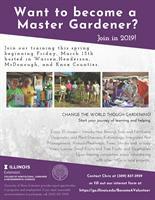 If you are interested in more information about becoming a Master Gardener, please contact your local Extension office or register at https://go.illinois.edu/BecomeAVolunteer.